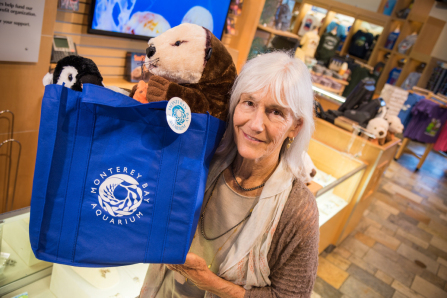 We’ve proudly shared the story of Shelby O’Neil, a Teen Conservation Leader at the Monterey Bay Aquarium who’s been making a huge different in the campaign to reduce ocean plastic pollution. 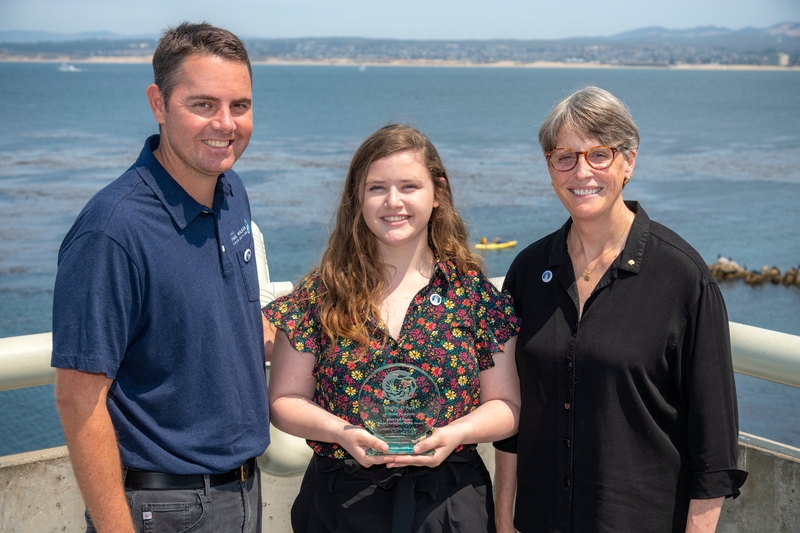 Shelby O’Neil receives the Paul Walker Youth Award from Brandon Birtell of the Paul Walker Foundation and Aquarium Chief Operating Officer Cynthia Vernon. She’s been recognized many times for her work, including as a guest speaker at Dreamforce and at Ocean Heroes panel during the Global Climate Action Summit. She’s one of the first class of Ocean Heroes recognized by the Aquarium, and earned a Girl Scout Gold Award for her work to raise awareness about the problem of single-use plastic – notably plastic straws. Now 17 and a senior at San Benito High School, she’s the 2018 recipient of the Paul Walker Youth Award, presented to young people who share the late actor’s love of the ocean and his commitment to take an active role in safeguarding ocean health. Through the Paul Walker Foundation created by Paul’s daughter Meadow, Shelby will receive a college scholarship to support her studies, so she can contribute in new ways to ocean and conservation initiatives. Nineteen aquariums across the United States have joined forces in a new Aquarium Conservation Partnership to address one of the gravest threats facing ocean and freshwater animals: plastic pollution. The partners just launched a nationwide consumer campaign, “In Our Hands,” and made their own business commitment to drive a shift away from single-use plastic among aquarium visitors, in their communities and beyond. Julie Packard sports a reusable shopping bag. 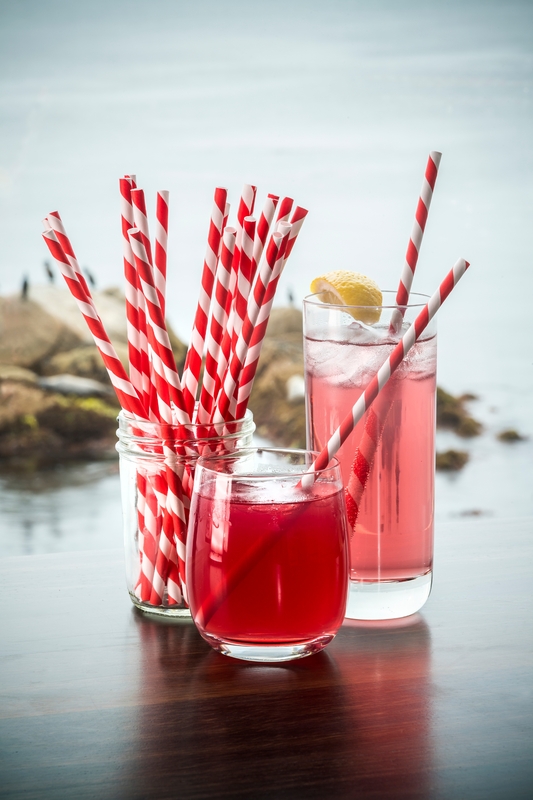 Aquariums have replaced plastic straws with paper straws. Many also sell reusable glass and metal straws in their gift stores. Through the “In Our Hands” campaign, the aquariums hope to empower their 20 million visitors, along with millions more people in their communities. The campaign focuses on innovative alternatives, and includes a website that encourages viewers learn more about the growing plastic pollution problem and be a part of the solution.